As the London 2012 Olympic and Paralympic Games roll on, watch this space for The Final Lap: our interactive social media finale where you will be able to hear from some of the many experts, organisations and volunteers that have helped us in our mission to find our 2,012 species of UK wildlife. Will we find our remaining species before the last anthems have been sung and medals won in London? This blog will light up for our last twelve days of species searching from August 22nd to September 2nd hosting guest blogs, interviews and fun things to get involved in at home. 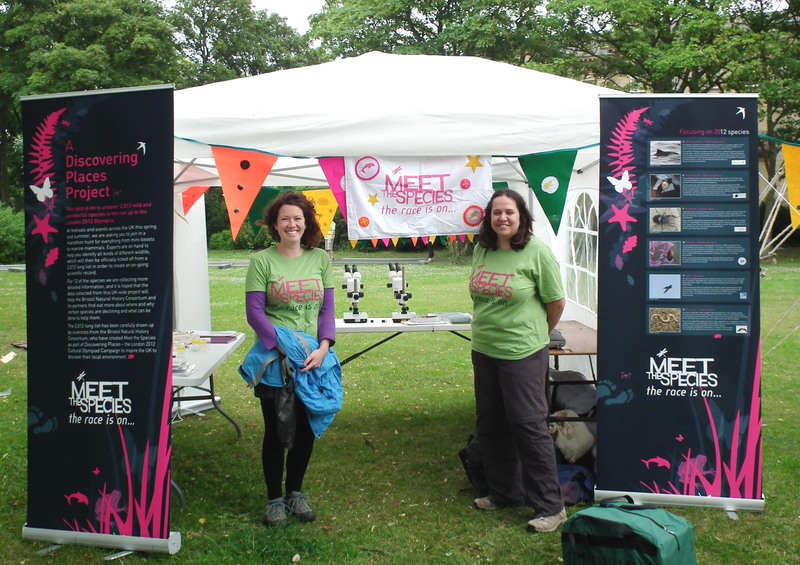 Having travelled the length and breadth of the country, the Meet the Species team brought their summer of adventure to a close with a trip to Wales for the Green Man Festival, where we were part of Einstein’s Garden, a fusion and celebration of art, science and nature. 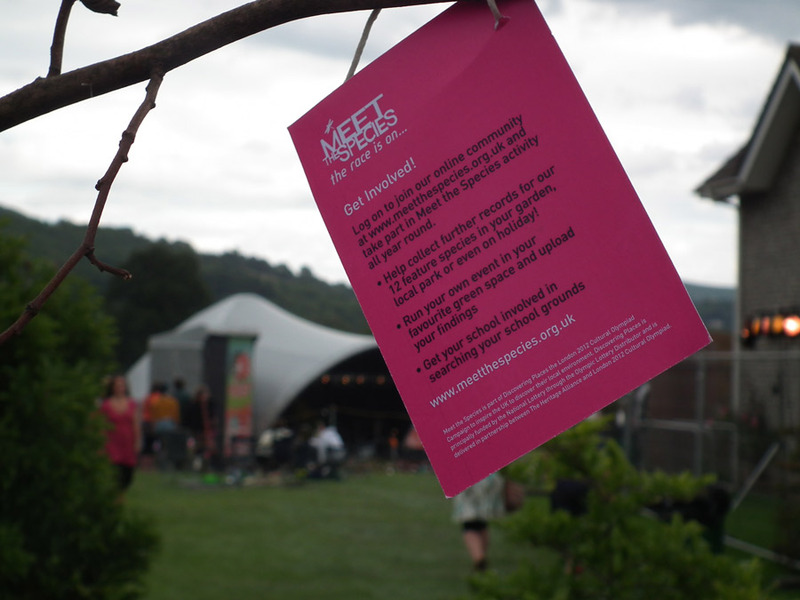 Setting up the Meet the Species HQ deep within the beautiful Glanusk valley, in sight of the main stage and with the peaks of the Brecon Beacons looming in the background, the site promised a perfect finale to the festival summer. With swallows swooping across the fields, red kites circling overhead, and a bank vole scurrying past even as we were pitching the tent, we set ourselves an ambitious target of recording over two-hundred species over the course of the weekend, a goal we were confident of achieving with the help of Green Man visitors. 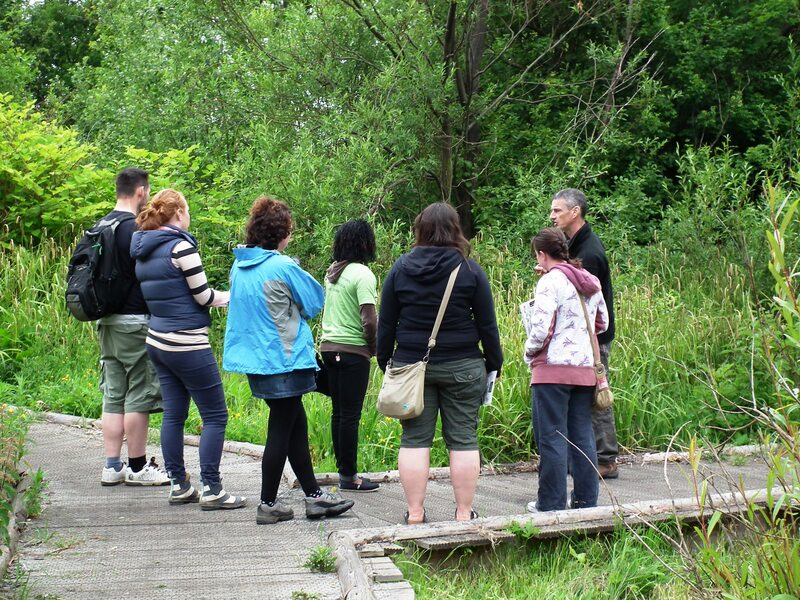 Teaming up with the expert naturalists of the Green Man wildlife walks, we were able to discover species from all types of habitat. Ladybird hunts, led by Remy, were able to uncover many of the incredible forty-six different types of ladybird present in the UK, including the invasive harlequin ladybird, one of our twelve feature species. Pete and David led the search for bugs and earthworms respectively, while Joe took crowds of people on a search along the banks of the River Usk for the tastier species of fungi and flora, finding edible delights such as sheep sorrel and yew berries. 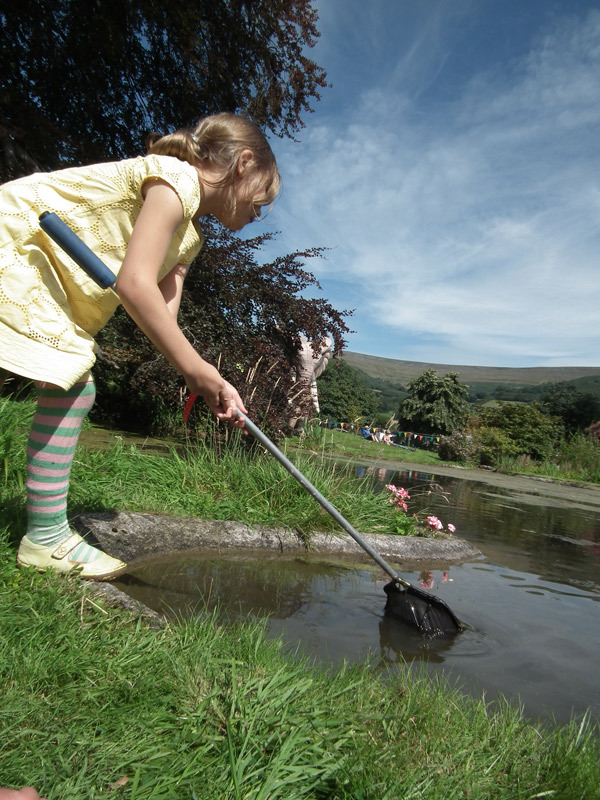 Nearer to base, Julie was able to demonstrate just how many species can be found even in a small pond, discovering a common toad, smooth and palmate newts, dragonfly nymphs and a water scorpion, amongst many others, to add to our list. 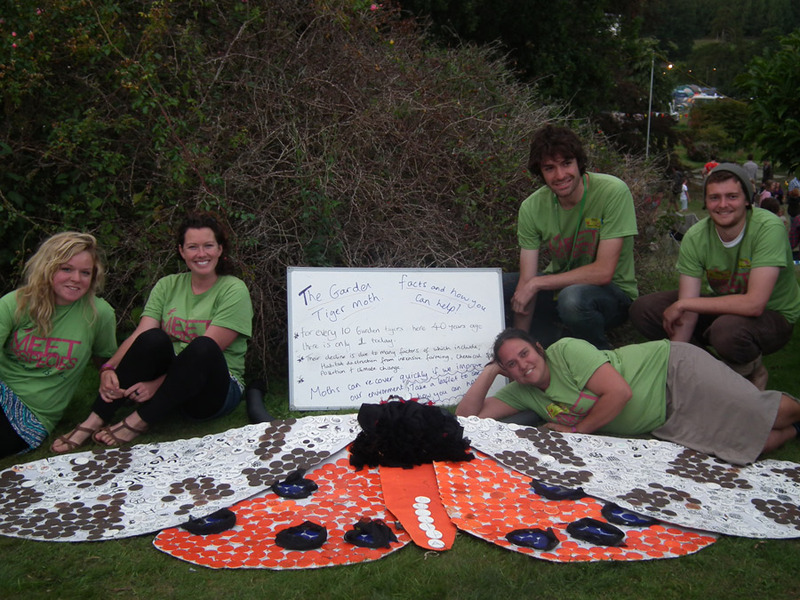 Back at the Meet the Species gazebo, visitors were also able to lend a hand as we created a giant garden tiger moth, illustrating scales that were then combined to create a huge image of this striking species, whose numbers have tragically declined by 90% in the last forty years. 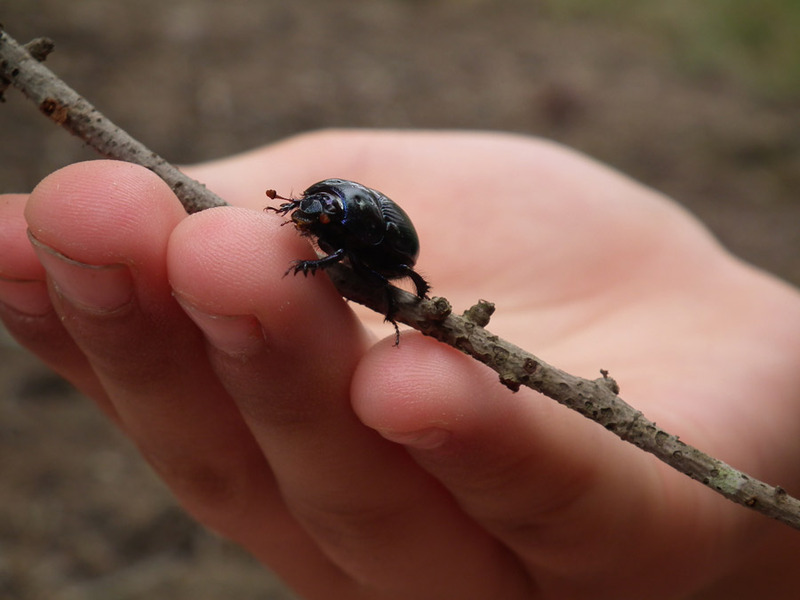 As the species total continued to rise, word spread that we were on the hunt for wildlife, and we were inundated with people reporting what they had seen, and bringing back specimens to be identified, from a delicate brimstone moth to an oak weevil that appeared positively extra-terrestrial under the microscope! 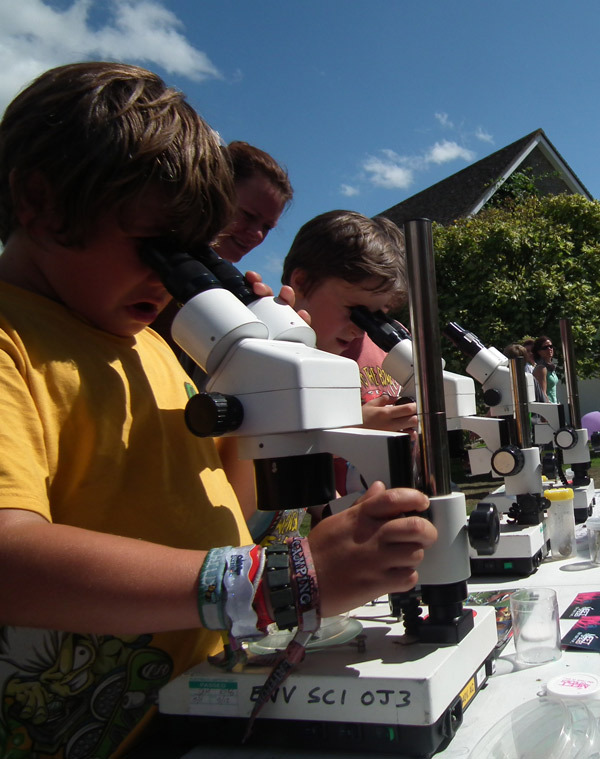 What can we see under the microscope? As Sunday evening approached, Meet the Species HQ remained a hive of activity, as species were collected, ID charts examined, and habitats explored for those last few plants and animals to add to the count. Thus with the brilliant help of Green Man visitors, we were able to reach our target, finishing the weekend with a grand total of 208 different species, a fantastic achievement, and a great way to finish our summer series of events. Thanks must go to all of the expert naturalists who have shared their expertise and enthusiasm with us throughout the summer, and also to all our species hunters, who helped us to find and identify so many different species. 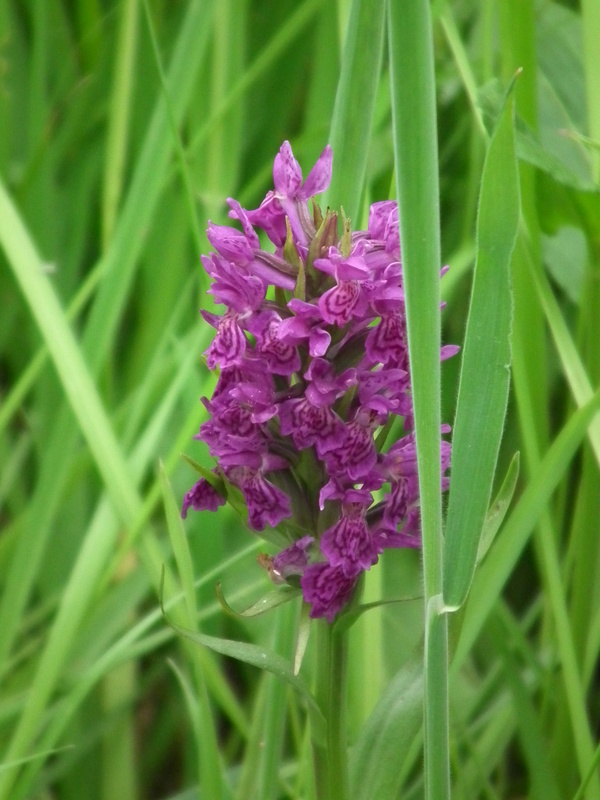 Our summer of events might be over, but there are still many more species on our list that still need to be discovered; the race to 2012 is still very much on! 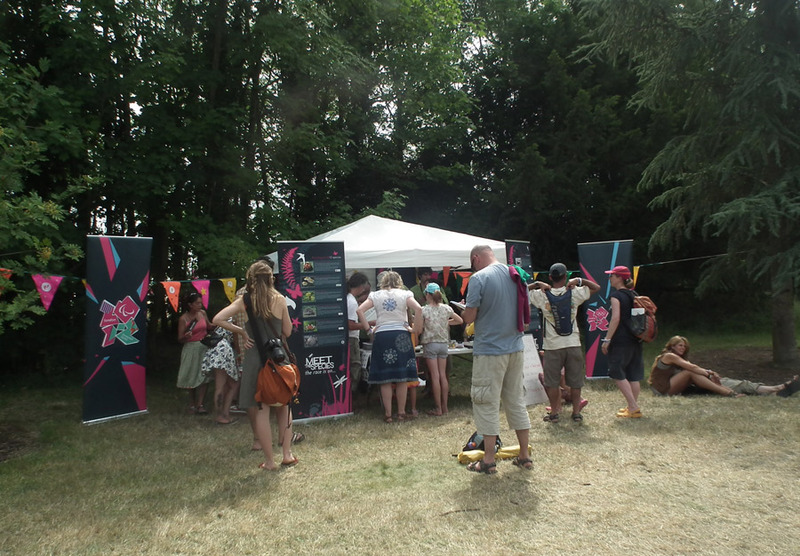 This week’s Meet the Species adventure saw the team continuing the hunt for our 2012 species deep in the heart of the Oxfordshire countryside, where we made our latest trip to the fantastic Wilderness Festival at Cornbury Park. Deep in the wilds of England, the festival proved a perfect place to explore a range of habitats, from grassy meadows humming with grasshoppers, to ancient woodlands of gnarled trees, and beautiful ponds just waiting to be investigated. After setting up the now well-travelled Meet the Species gazebo on Friday afternoon, our first wildlife walk headed out as the sun was setting, as we explored the woodland by moonlight on the search for bats. The enthusiastic crowd, equipped with bat detectors and led by our naturalist Lydia, managed to seek out a number of pipistrelle bats flitting between the trees, and when we returned on Saturday evening, Daubenton’s bats along the edge of the lake. Each day kicked off with visitors gathering round the moth traps laid the night before by our bug expert Martin, and we were rewarded with a number of different species each morning. 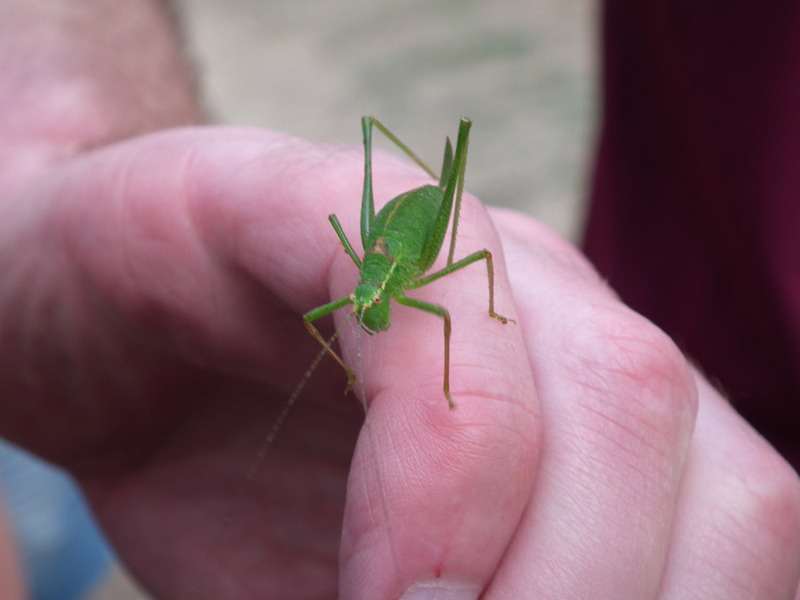 Groups set out throughout the day to explore the different habitats of the site, including armies of bug hunters equipped with nets, who uncovered an amazing number of insects, in particular an incredible range of crickets and grasshoppers – with some literally hopping straight into the hands of our explorers! Plant and tree walks, led by Graham, also found a great diversity of wildflowers and trees, from venerable old oaks to the forebodingly named deadly nightshade. As well as going out in search of wildlife, a number of species could be found back at the Meet the Species tent, as people brought their own finds to us from the nearby fields, or even from their own tents, including an variety of beautiful beetles and spiders that we helped to identify and examine further under the microscope. 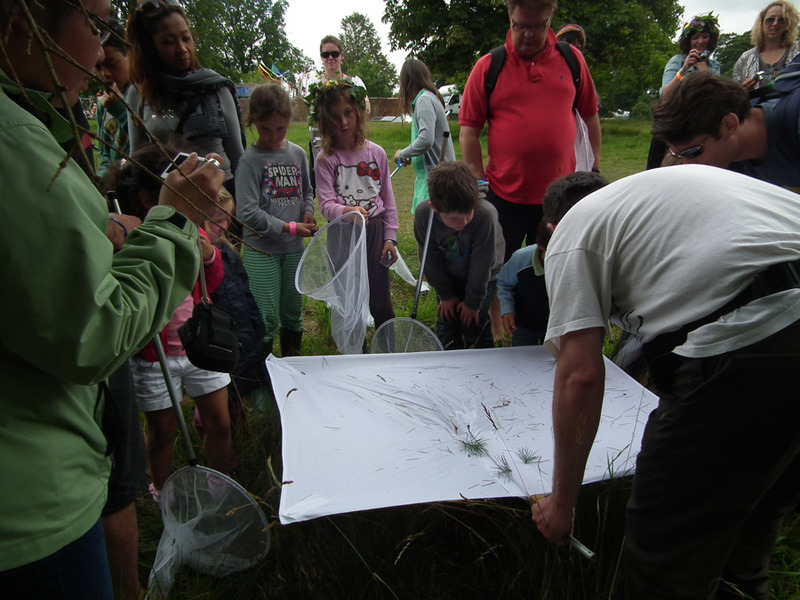 Our pond dipping expeditions also returned with some great samples, with signal crayfish, a three-spined stickleback, a great water boatman and freshwater shrimp, amongst many others, all being ticked off the species list. 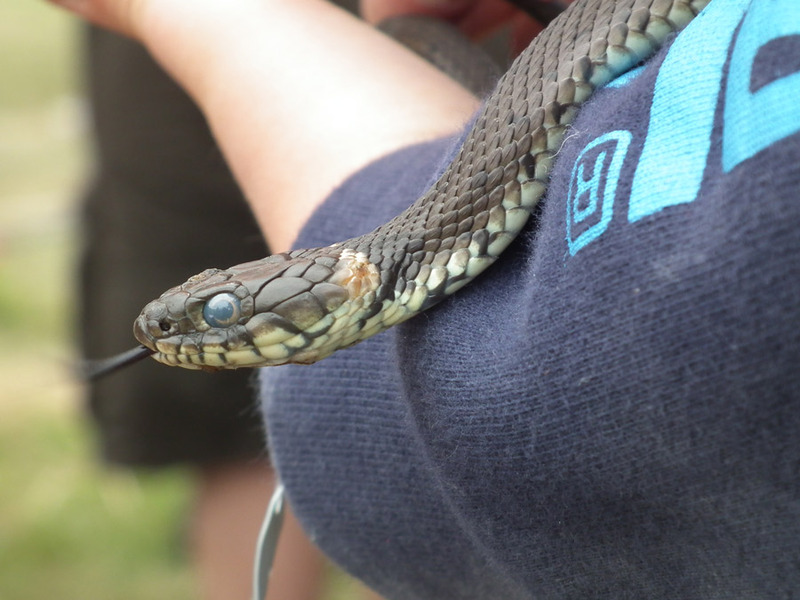 Finally, on Sunday we were granted a special treat, as Rod, our reptile and amphibian expert, brought along two grass snakes and also a slow worm – one of our twelve feature species– that he had found during a nearby survey, allowing people to get a closer view of these often elusive reptiles. Just two full days of species hunting managed to produce a total of almost two hundred species, many of which we were able to tick off the 2012 species list for the first time. Thanks must go to Lydia, Martin, Nina, Dominic, Graham and Rod, for their assistance over the weekend, and to all our fellow Wilderness explorers who helped to hunt down the different species. Just a few days rest now, and then we head off to Green Man Festival in Wales for our next adventure – come and join us there as we continue the race! 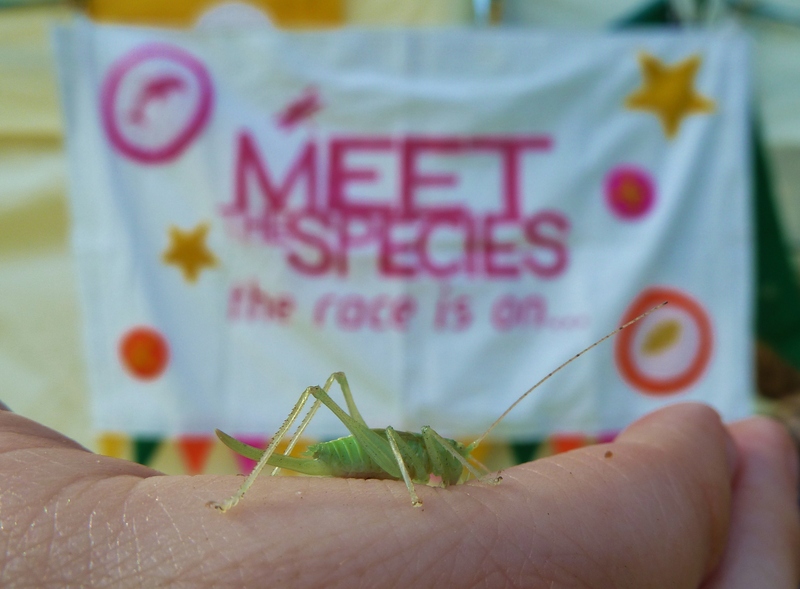 Last weekend Meet the Species made the short trip to Wiltshire for our first music festival of the summer, taking our wonderful wildlife discovery roadshow to WOMAD festival. 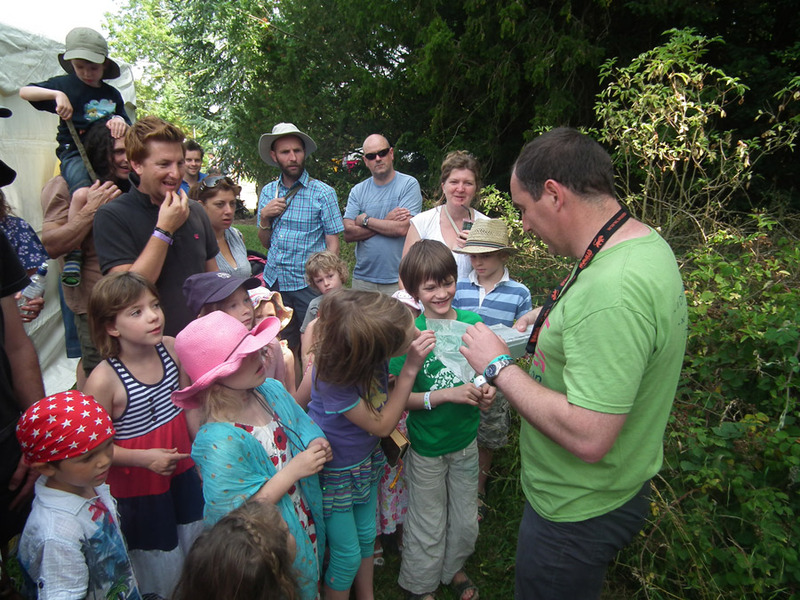 WOMAD is a celebration of the diversity of music, art and dance from across the globe, but this year festival-goers were also able to experience the amazing diversity of species to be found underneath their very feet in the beautiful Charlton Park arboretum. With expert assistance from our local naturalists Paul, Jane, Neil and Mark, and boundless enthusiasm from visitors young and old alike, we set out to explore the arboretum, with species hunts leaving every half an hour and all returning with new findings to be added to the list and examined under the microscope. Despite the trampling feet of 30,000 music fans, our hunts uncovered insects and minibeasts aplenty, from beetles to spiders, bumblebees to moths. On Saturday evening, around twenty-five people gathered, armed with detectors, to follow Mark on a bat walk, and despite the loud music, we were able to hear and see several common and soprano pipistrelles. 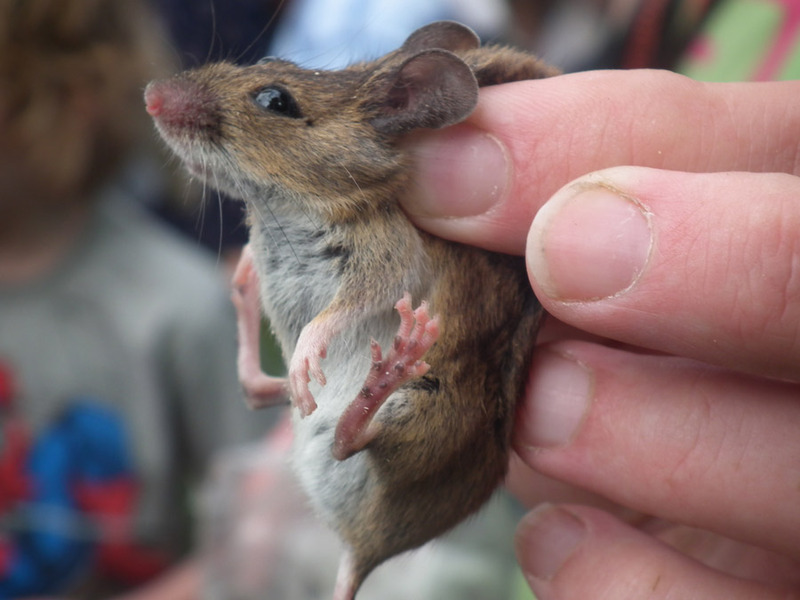 Our hunt for small mammals continued on Sunday morning, as Mark led a crowd to check the traps placed in the undergrowth the night before, and discovered both a wood mouse and a rather feisty yellow-necked mouse. After three days hunting, by Sunday evening we had been able to find a grand total of 166 different species, a great total that showed just how much it is possible to find even in a site full of crowds of people. A huge thank you must go to our wonderfully knowledgeable and engaging naturalists, and to all our enthusiastic species hunters who combed the woods, fields, hedgerows and ditches of Charlton Park throughout the weekend. 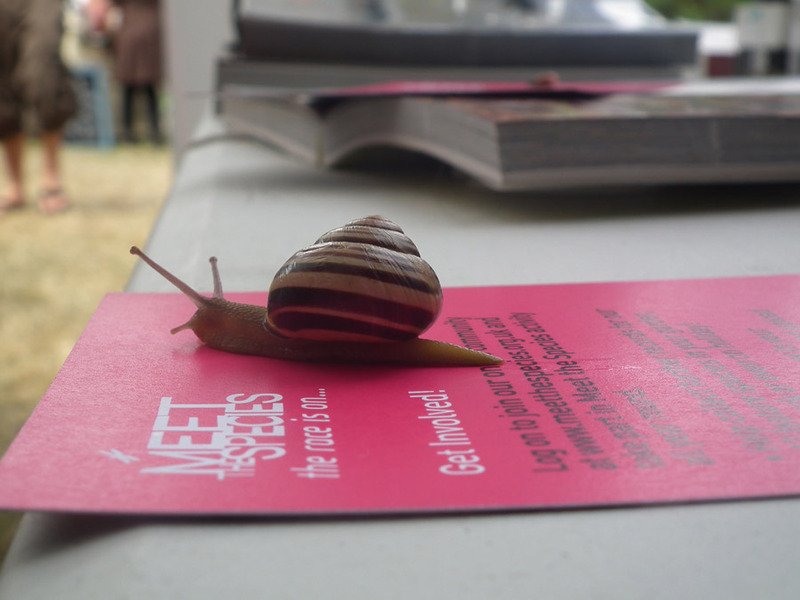 The next stop for Meet the Species is Lollibop festival in London’s Regent’s Park, so come and join us there as we continue the race towards 2012 species!